Taiwan's main opposition party has begun its first visit to China since Communist forces defeated it and took power on the mainland in 1949. 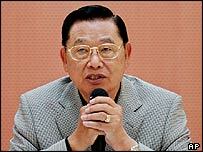 The 30-member team of the Nationalist Party or Kuomintang (KMT) is being led by vice chairman Chiang Pink-kun. Mr Chiang said the visit was aimed at easing tensions with Beijing. China sees Taiwan as a breakaway province. 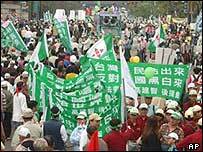 Earlier this month, Beijing passed a law, allowing it use force to stop any Taiwanese independence moves. "We hope to help ease cross-strait tensions to ensure people's well-being," said Mr Chiang, on arrival. "[We hope] to do what the government does not do and cannot do." He said earlier: "We oppose Taiwan independence. We advocate peace across the Strait and oppose the mainland using force." The delegation will go to the southern city of Guangzhou to visit the graves of dozens of KMT members who died during an uprising against the Qing Dynasty in 1911. The Taiwanese officials will also visit the grave of the party founder, Sun Yat-Sen, in Nanjing. They will wind up their five-day trip in Beijing, where they are likely to meet the head of the National People's Congress, Jia Qinglin, Taiwan's China Times newspaper reports. It said the issue of KMT leader Lien Chan's visit to China would be discussed during the meeting. The Nationalists were defeated by the Communists and sought refuge on the island of Taiwan in 1949. The party - which was in power for more than 50 years until 2000 - is now considered to have closer relations with China than the governing Democratic Progressive Party (DPP), analysts say. China has strongly criticised the DPP's drive to change the constitution, which Beijing says could lead to a bid for full independence. The KMT's visit comes just two days after hundreds of thousands of people marched through Taiwan's capital, Taipei, protesting against China's anti-secession law. Chinese state-run media on Monday condemned the rally. "It further exposes the secessionist forces' attempt to misuse people power to pursue their secessionist agenda," said an editorial in the China Daily newspaper. Another central newspaper - the People's Daily - described Saturday's demonstration as a political farce. Is China's new law a provocation to Taiwan?